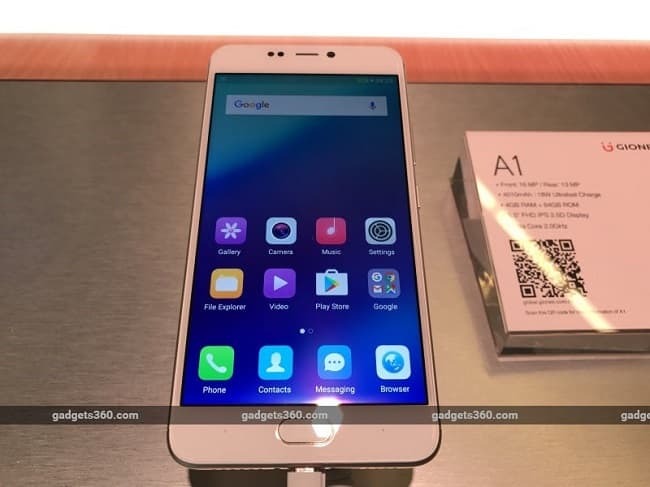 After Oppo’s F1 and Vivo’s Y66, Gionee’s is here with its selfie focused smartphone series A1. The series includes 2 devices namely A1 and A1 plus and was first showcased at this year’s MWC event. Today, company launched the smaller variant, Gionee A1, at a launch event in New Delhi. The whole event was streamed live and is available to watch on their official Facebook page. Coming at a price of Rs. 25000 the phone is advertised as camera and battery focused. Nothing fancy is done to the phone’s outlook which resembles OnePlus 3T a lot and that’s not bad at all. The device looks elegant in a full metal body construction. 2.5D curved glass protection adds to the beauty of device providing a smoother look altogether. Display is amazingly sharp as expected from a 5.5-inch full HD super AMOLED panel. The device weighs 182 grams and has a thickness of 8.5mm. A battery of 4010mAh explains over 8mm thickness and that’s acceptable provided it claims a battery life of more than a day at heavy usage. Front camera is specialty of Gionee A1. A 16MP sensor with a f/2.0 aperture is provided along with front LED flash to enhance the selfie quality. A 13MP rear camera capable of recording FHD videos also clicks decent images. Under the hood, there is a Helio P10 coupled with 4GB of RAM to handle day to day processing. P10 chip is a bit disappointing but that’s not much of a problem for general use. 64GB of internal storage is provided which is expandable to 128GB. You get all the connectivity options including support for VOLTE and a USB-C connector capable of extra-fast charging. Overall, it’s a good-looking smartphone for selfie lovers. If lack of dual camera setup disappoints you, go for Honor8. One Plus 3T is an option too which is a bit costlier but scores better at every front except selfies. All of this boils down to A1’s USP. If u want a phone for selfies, you got it.